The JLA must make a gut-wrenching decision: to maintain neutrality in a galactic conflict with their old foe Kanjar Ro or interfere in foreign politics by conducting a preemptive strike of its own. 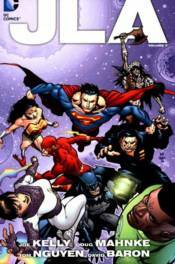 Plus, a standoff between federal authorities and a metahuman settlement leads to trouble! Collects JLA #77-93.